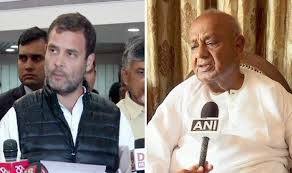 New Delhi: Congress President Rahul Gandhi will meet former Prime Minister and JDS leader HD Deve Gowda in Delhi on Wednesday. The two leaders are expected to hold discussions on the issue of seat-sharing in Karnataka for the coming Lok Sabha elections. On March 3, Deve Gowda had said that they had agreed to join hands with the Congress to revive secular forces. “The two parties will finalise seat-sharing very soon,” he had said. Earlier, on February 28, Chief Minister HD Kumaraswamy had said that if the Congress and JDS alliance won at least 20-22 seats in the state, then a Kannadiga could once again become the next Prime Minister of the country. There are 28 Lok Sabha seats at stake in Karnataka, out of which the BJP currently holds 16 seats, while the Congress and the JDS hold 10 and two seats, respectively.